When it comes to the Manhattan skyline, 217 West 57th Street, aka Central Park Tower, will soon reign supreme, reaching 1,550 feet above the streets below. But a new concept proposed by DFA would provide Central Park with an actual tower of its own, though its existence would be limited to a temporary duration. 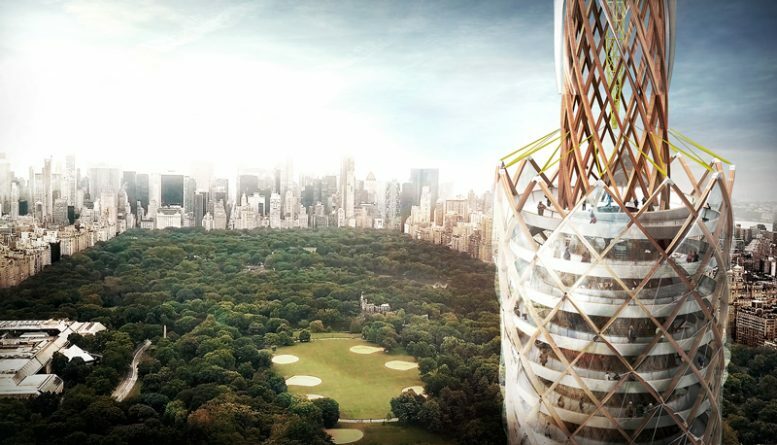 The tower would be made of prefabricated timber, and stand 712 feet to its pinnacle. The structure would actually sit within the Jacqueline Kennedy Onassis Reservoir, and besides acting as an observation platform, it would also treat the Reservoir’s water. 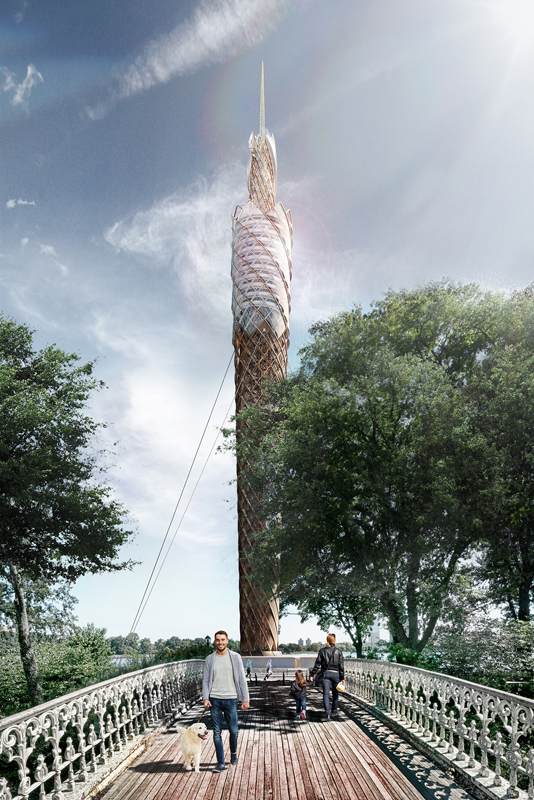 DFA envisioned a buildable 712-foot observation tower that double as environmental infrastructure, a call to action for ensuring public follies are performing for the city. Here we combine architecture, recreation, resiliency, and tourism in a project millions of New Yorkers and visitors would benefit from. While realization of the plan seems exceedingly unlikely, its temporary existence would make it substantially more palatable, and help armor it against NIMBY critics. Though the scale of the structure is proportioned in a dramatically different way, technically, Central Park Tower would actually take up vastly less space compared to previous art installations. The Gates, which ran from February 12th to 27th, 2005, wrapped along 23 miles of Central Park’s pathways, with 7,503 “gates” covered in fabric creating a memorable experience for New Yorkers, and becoming a tourist draw in and of itself. Though the 712-foot pinnacle of Central Park Tower may seem substantial, the 57th Street skyline is now dotted with buildings that will soon rise twice as tall. Even for its limited existence, the height of the tower would not overwhelm the scale of any surrounding neighborhood, with its location in the middle of the reservoir making it as relatively isolated as is physically possible on the island of Manhattan. 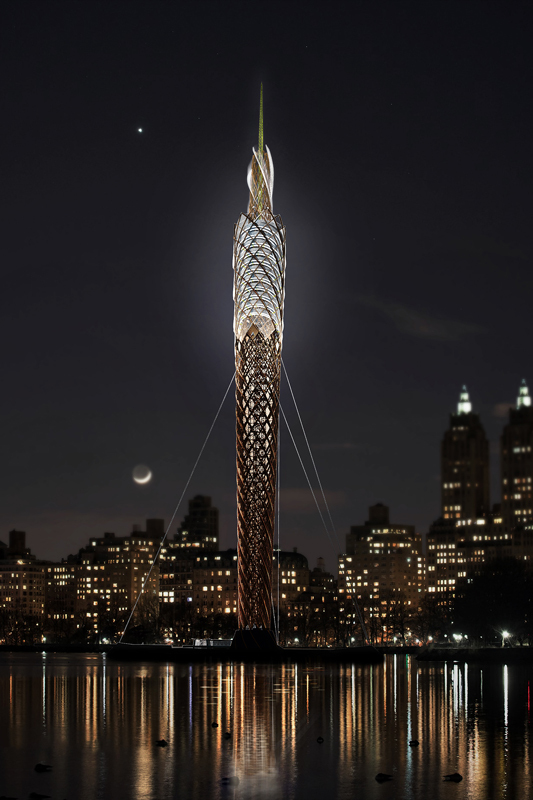 Finally, New York City already has a relationship with short-lived wooden observation towers. The Latting Observatory ranked as the city’s tallest structure from 1853 till 1856, before it was consumed in a fire. While Central Park Tower’s planned disassembly is likely to be somewhat less dramatic, the concept is hardly a new idea, though in this instance, a World’s Fair would not be necessary for a project of both artistic and civic merit to positively impact the island of Manhattan. 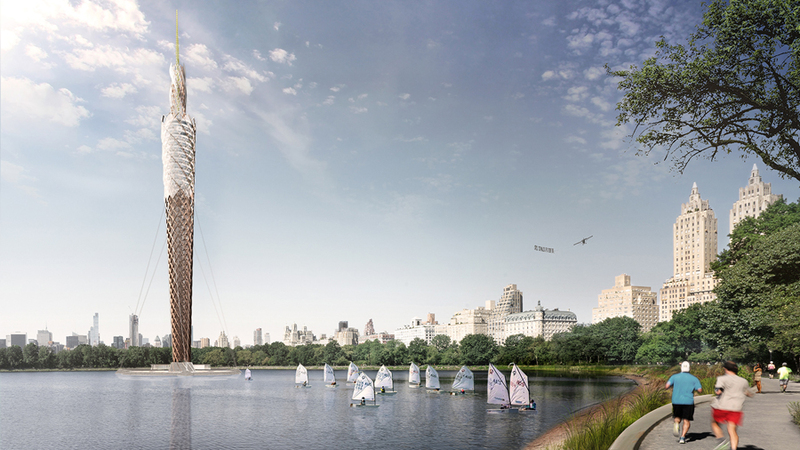 6 Comments on "Design Concept Revealed for Another Central Park Tower, Jacqueline Kennedy Onassis Reservoir"
Ice-cream cone designed will winner in Manhattan. This “thing” is ghastly. Go ahead, read the architect’s statement, it sounds just as ghastly. I hope this firm designs better than it writes – well, it obviously can’t. Looks like a soldering tool. Oh man… I love tall things, but please God — not this.